I love the fact that kids will be kids, regardless of their surroundings. This image is a prime example. 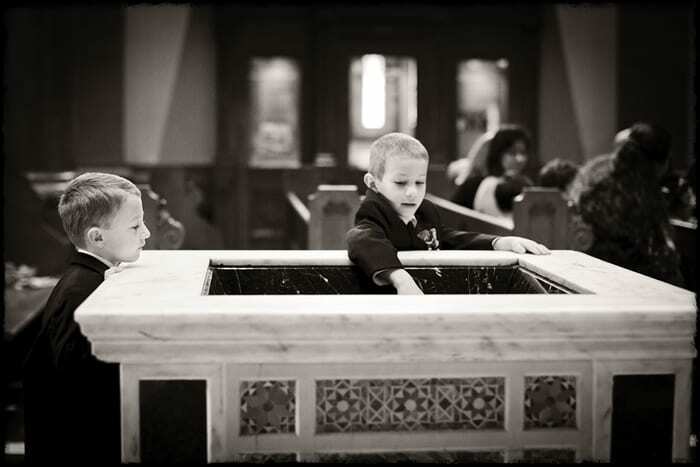 Even though these two young boys are wearing tuxes in a cathedral surrounded by flowers, stained glass, and women in beautiful dresses, the temptation of playing in the conveniently placed pool of holy water proves too much. This image was literally taken only moments before the bride was about to walk down the aisle. The surrounding and timing couldn’t have been less important to these two. This moment proves that boys will be boys… wherever and whenever!